When you think of high-end fashion it is usually the clothes that come to mind. But would you believe the big money-maker for some designers has nothing to do with clothing? Our Alina Cho reports on how some designers make millions on scent, not style. With golds for snowboarder Shaun White, skier Lindsey Vonn and speedskater Shani Davis, plus three other medals, the U.S. wins six Winter Games medals in a day for the first time. Today, America is looking to snowboarder Shaun White to bring home even more medals. Just yesterday, he won gold in the men's half-pipe. Our Mark McKay is in Vancouver and got a chance to meet the action sports rock star. The Dalai Lama arrives in Washington, D.C. on February 17, 2010. Washington (CNN) - President Obama will meet the Dalai Lama, the exiled Tibetan spiritual leader, on Thursday at the White House despite strong objections from the Chinese government. The meeting has the potential to complicate Sino-U.S. tensions further, which have been rising in recent months. China has warned the meeting will certainly damage ties with Washington. "It will seriously undermine the Sino-U.S. political relations," Zhu Weiqun, a senior Communist Party leader in charge of ethnic and religious affairs, said recently. "We will take corresponding action to make relevant countries see their mistakes." 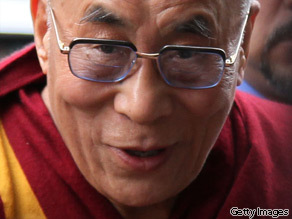 The Dalai Lama has said he favors genuine autonomy for Tibetans, not independence for Tibet. Beijing regards the Nobel Peace Prize laureate as a dangerous "separatist," a politician who wishes to sever Tibet from China. Program note: The Dalai Lama goes one-on-one Monday with CNN's Larry King in his first interview after his meeting with President Obama. Hear his thoughts on China, human rights and the situation in Haiti. At 9 p.m. ET Monday on "Larry King Live." Democrats are marking the stimulus program's one year anniversary with a new name for Republicans: Hypocrites. The White House is leading the charge, accusing House Minority Whip Eric Cantor of reaping stimulus rewards in his home district while telling the media the program hasn't helped the economy at all. There was plenty more partisan bickering over the $787 billion bill yesterday, which is now estimated to cost tax payers $862 billion over the next ten years. Our Jim Acosta has the report from Washington. Toyota's growing list of problems really came to light after a California Highway Patrol officer and his family were killed when their car took off at speeds of more than 100 miles per hour. Police say the problem was the floor mat. But as our Deb Feyerick reports, the victims' family is not totally convinced.